HADDONFIELD, N.J. -- The drive to fund Haddonfield's dinosaur sculpture project has raised $25,000 in cash and $30,000 in commitments so far, according to committee fundraising coordinator Susan Baltake. Artist John Giannotti at work today on the wood and iron superstructure that will be used to make the molds needed to cast the final version of Hadrosaurus foulkii in bronze. with the unveiling of a full-size rendering of the planned 8-foot-high, 14-foot-long bronze statue of Haddonfield's famed dinosaur, Hadrosaurus foulkii. The goal of the program is to raise $100,000 to pay for the sculpture as well as the engineering and landscaping work required at the Lantern Lane installation site in downtown Haddonfield. To date, Ms. Baltake said, contributions have ranged from $10 to more than $3,000 and have come from private individuals, corporations, organizations and foundations. One of the most recent grants has come from the Camden County Cultural and Heritage Commission. 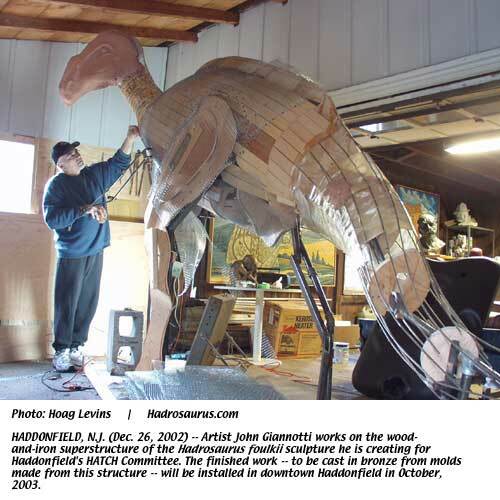 Organized by local civic committee HATCH (Haddonfield Acts To Create Hadrosaurus foulkii), the Hadrosaurus sculpture project is scheduled for completion in October of 2003. As part of an overall commemoration program, the borough has declared 2003 to be Haddonfield's "Year of the Dinosaur." In a related event involving area schools, teachers and other organizations, the HATCH Committee is sponsoring a "Dinosaur Day" of events and activities for children and adults on April 5. Ms. Baltake noted that all contributions are tax-deductible through the Haddonfield Foundation, a non-profit 501(c) organization. Contributions are also being solicited through sales of Hadrosaurus pins, T-shirts and other gift items on the committee's Hadrosaurus.com Web site, along with tickets for "Dino Day." For more information, contributors may contact the Haddonfield Visitors' Center at 856-216-7253 or see relevant sections on the front page of Hadrosaurus.com. Hadrosaurus.com also provides in-depth background about the historical importance of Hadrosaurus foulkii.